The 8 oz wheat bunches are perfect for both formal and informal decorating needs. The 8 oz wheat comes in both short and long stem, which also makes it a great crafting wheat choice. 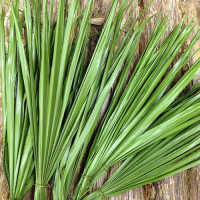 Wheat stems can be soaked for eight to twelve hours and then woven or braided into ornaments, wall hangings or wreaths. Our 8 oz wheat is the perfect size for placing in a quart jar for a quick and ready country look display. Just simply removed the wheat from the mylar sleeve, and place it in a quart jar. 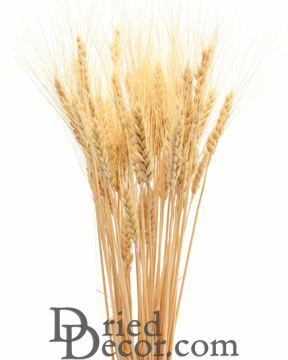 The wheat will naturally tumble into place in a perfect display, ready to use as a centerpiece or room brightening bouquet. The 8 oz wheat bunches are perfect for both formal and informal decorating needs. 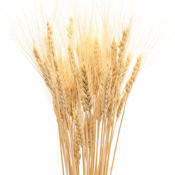 The 8 oz wheat comes in both short and long stem, which also makes it a great crafting wheat choice. Wheat stems can be soaked for eight to twelve hours and then woven or braided into ornaments, wall hangings or wreaths. Our 8 oz wheat is the perfect size for placing in a quart jar for a quick and ready country look display. Just simply removed the wheat from the mylar sleeve, and place it in a quart jar. The wheat will naturally tumble into place in a perfect display, ready to use as a centerpiece or room brightening bouquet. For a more formal look, the 8 oz wheat comes in both long and short stem to fit any decorating needs. Wheat adds simple elegance to any occasion. To make a formal display, wheat can be placed in an elegant vase, or mixed with multiple grains, grasses and/or flowers and tied with ribbon. 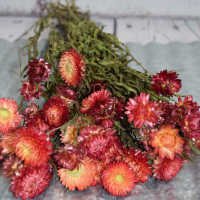 Tie a bundle of wheat mixed with avena oats, millet, rice and straw flowers together with a ribbon in a stand alone bunch as a formal centerpiece. Whatever the occasion, from a wedding to a barn dance, a formal dinner centerpiece to a tailgate party, a display of wheat can bring with it a freshness and a feeling of sunshine and plenty. 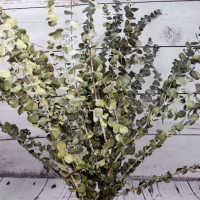 This organically grown product is naturally dry and will last for years in a dry, pest free environment. perfect for fall decorations. arrived intact and in great shape. was very pleased with the fast shipping and packaging. my new go to place for natural decorations. This product was perfect. It was delivered in a timely manner and was exactly as described. Fantastic! Full bunches and look great as fillers. Great products and delivery. Keep up the good work. beautiful, perfect product delivered in a timely manner. Thank you for your excellent service. Best dried wheat I have ever seen in 40 years of using dried materials. I will be back. The dried wheat was everything I expected. It looks great and there was more of it than I thought there would be. It was timely and I had no problems! The quality of the product was very good. I was pleased with what I received. The web site and ordering was user friendly. Shipping was prompt. The wheat I ordered was pristine! Even the packaging was excellent. I would not hesitate to order from your company again. Thank you!!! I hunted all over for wheat for decorations at our church Anniv. celebration! Could not find it anywhere in town! So happy for your website! I rec. my order in plenty of time and I so appreciate your expediency and packaging was wonderful as well! Great looking wheat, very fast service,couldn't be happier! Great price; great look - just what we were hoping for! Will come in box just as shown in picture, or even better Overall I am very very happy with my order. I had read all the wonderful reviews and was pretty sure I will be posting a similar one. Their customer service is fantastic. Stunning dried wheat! I am ordering more for my wedding! Looks great and shipped fast. No damages when shipped, which I was worried about because some dried items fall apart when shipped. Excellent quality and the product held together did not have any loose crumbles! Great addition to the arrangement we used it for! Love the color and the length.Just perfect for parts of my Wedding decorations. I'm very impressed how fast my Order was shipped. I am so happy with my Products, my Wheat Bunches are looking better than in the Pictures. Can't wait to use them for my Wedding Decor. So beautiful! I'm wishing I ordered more. 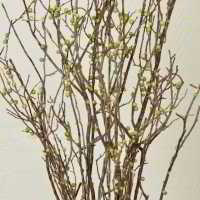 They are a great height for centerpieces. I love this site. The customer service is great and my concerns were responded to almost immediately! There is a nice variety of products. I'm planning a fall wedding and didn't want every decoration to be made up of silk leaves. 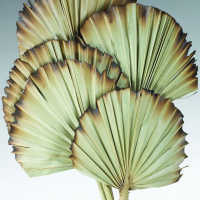 DriedDecor.com is a fantastic way to incorporate beautiful, natural elements to any design. Good quality, shipped well, just what I wanted. Thank you! Quality product great for making my heart and Celtic knot ornaments. Prompt service. Great quality of products I have ordered. Love the variety. 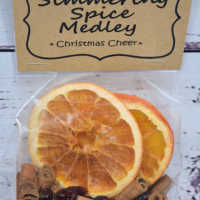 Good color choices and seasonal products. Love everything from the whimsical to the "memory makers". The product was what I expected and was delivered super fast! So happy with my purchase! The wheat stalks were beautiful, large enough to stand on their own and made great centerpieces. Ordering was easy. Product arrived in a timely manner. The product (wheat) was great quality at a very reasonable price. good customer service. They called me back right away when I tried to order by phone and was unable to reach them the first time. The dried wheat arrived quickly and was in good condition! She loved all of it. Thank you for beautiful flowers. My friend overseas loved it and it was delivered promptly too to Malaysia, which is not always easy. Thank you. Beautiful arrangement of wheat. I will use this in my bridal bouquet. Quick delivery and just as described online. Love this little arrangement. Also a great price for the product. I am very happy! Love the items you sent to me. I am highly allergic to live plants but with these dried flowers I can still carry a bouquet down the aisle and for that I thank you! Great site. Keep up the amazing work. Product was in excellent condition and exactly what we were looking for. The wheat was in good shape and of consistent quality. My order was quickly shipped. This was my first order. I will order again. I found the items to be of high quality. They were quickly shipped. Perfectly beautiful. They came in good time, packaged well, and beautiful. Great quality, nicely packaged! Arrived on time and safely. Thank You! Wheat was very full and in perfect condition with none broken. Wrapped very carefully and in good condition when received. Thanks for your great products. We can't wait to order more. The product was exactly as described and I am very pleased with the speedy delivery. I am completely satisfied with DriedDecor.com. The product was exactly as described and I am very pleased with the speedy delivery. My wheat arrived in beautiful shape. As I intend to use this as part of a centerpiece for my daughter's wedding reception I was looking for quality. I found it here. My daughter wants to use this in her fall wedding and she is very pleased. Beautiful American Wheat! I will use it this September for my daughter's wedding. Beautiful America Wheat! I look forward to using it for our daughters wedding reception center pieces. It came well packaged so no breakage. The picture is a true representation of color and much better quality than what you find at local craft centers. Beautiful product and just exactly as described. The service was faster than I expected. Thank you! This product was exactly what I wanted. The description that was given matched the product perfectly. I was very pleased. I will order again from this company! The product was exactly as described and packed very well. Thanks for making the purchase easy! The dried wheat is beautiful! A lot for your dollar, I highly recommend this company! Great products, great service, great price. I highly recommend this company! The dried wheat bundle was well packed and arrived quickly. Very pleased with this purchase. Shipping costs seem high --even for standard. Excellent service and the product was authentic. I'm very happy with the product I order. Looks amazing and the perfect size to fill our mason jar centerpieces. The product is exceptional and came in perfect condition. Price was good and the wheat was so pretty - larger than expected, and somewhat fragile. Tips found on the website for working with it were helpful. Wanted this product for a long time. It looks just like the picture. That is important. Will order again. 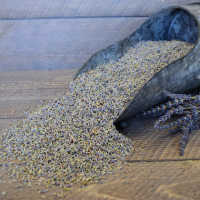 This wheat bundle was great for my rustic centerpieces for my wedding, they look perfect paired with the lavender bunch inside my spray painted bottles. Had no problems at all. I received almost immediate feedback from a question I emailed your company. Easier to order and delivery came on time. Large amount of wheat in bundle. Great quality! Thank you! Thanks for being so easy to work with! Excellent quality and was exactly what we needed. Thanks so much! Quick shipping and careful packaging! Thanks! 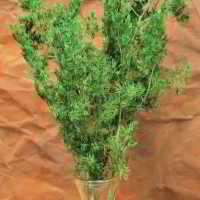 I found this product to have nice long stems and beautiful clean heads. The wheat was consistent in color and the all the stems were uniform in quality. The order arrived quickly and in excellent condition, I will use the sturdy packing box for storage since the wheat is to be used for Swedish Christmas decorating only. Beautiful gold wheat, came in tact and bundled in separate bunches making it easy to store and use as needed. Product is beautiful!!! I will purchase this again. Product is exactly what I expected from description. Overall would recommend these products. Service was prompt. High quality, quick delivery, would 100% recommend DriedDecor.com. 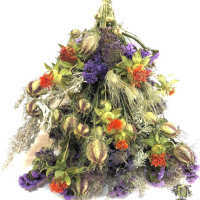 Great flowers, delivered in time, long lasting bouquet. They were perfect for the occasion. Packaged well. Packed well, quick delivery. Will use again. Satisfied with product, price, and quick delivery time. Would recommend ordering from this company. 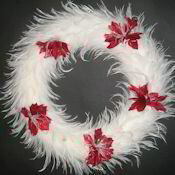 Fine Need to use yet then I will have a better answer and see if my clients like the look of wheat in their wreaths. Everything was fine and received on time! The wheat stems came well protected in a right sized box. Way better than expected! Will be perfect for wedding center pieces and bouquets! Fast shipping! The beards weren't as long as I expected. 8oz was a great amount! Really appreciated talking with a rep who helped me identify where my order was after I received a strange shipping notification! I was quite please with the product. It was everything the description said it would be! Real, good quality 2016 year harvest, but smaller than in picture. Great product! I wish there was more for what you pay for and I wish the dried wheat would have came in a longer length then the choice they have.